How to Steal a Million -- If I could steal the wardrobe from any film, I think it would be this one. Audrey Hepburn's outfits are so crisp, mod and oh-so-sixties. Sure she introduced the world to the LBD as Holly Golightly, but each and every one of her outfits in How to Steal a Million is just as good that one dress in the opening scene of Breakfast at Tiffanys! I couldn't really pick any single Marilyn Monroe film, but I thought that leaving her out of the LA Times list was a glaring error. Audrey Hepburn and Grace Kelly may be remembered more as style icons of the 1950's, but for curvy girls like me, Marilyn Monroe is proof that we can carry off an outfit just as nicely as (or better than!) stick thin girls. Her wardrobe in How to Marry a Millionaire and Gentlemen Prefer Blondes may be my favorites. 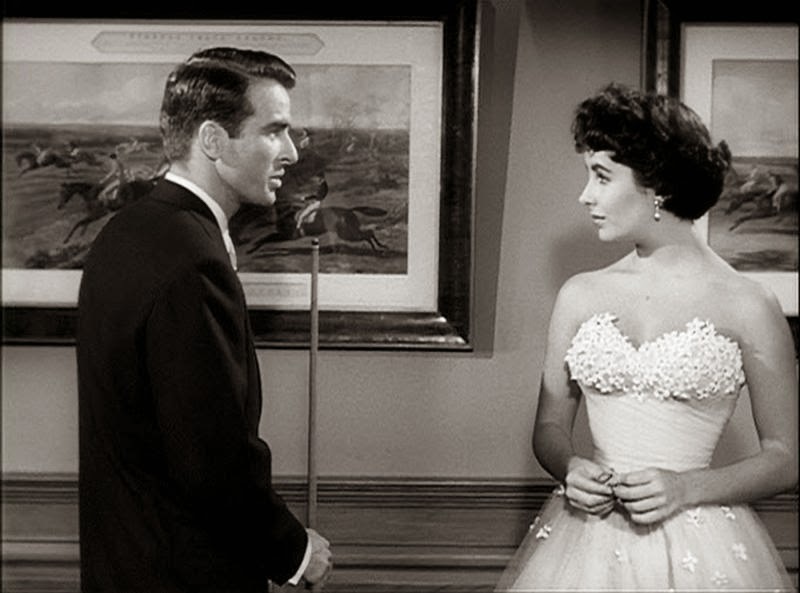 A Place in the Sun - Much like Clark Gable's sans-undershirt performance in It Happened One Night sent undershirt sales plummeting, Elizabeth Taylor's dress in A Place in the Sun was one of the most copied movie dresses ever -- girls everywhere were dying to wear this to their proms! And as evidence of its timeless appeal, I bet even modern teenagers would be thrilled to have a dress this beautiful for their own highschool proms. 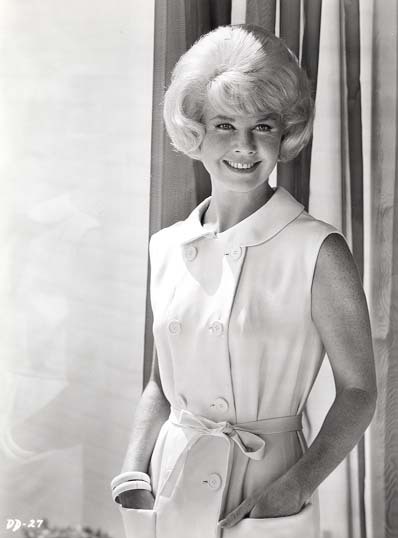 Doris Day in the 1960's -- The Glass Bottom Boat, Please Don't Eat the Daisies, Send Me No Flowers and Lover Come Back. I think that the 1960's style can be broken down into three categories: the wild child look of the late 60's, the bold mod style a la twiggy (or How to Steal a Million Audrey Hepburn) and the clean, pulled together, chipper look of Doris Day. Really, she gets a whole category to herself. Kay Francis was probably THE style icon of the movies in the early 1930's. 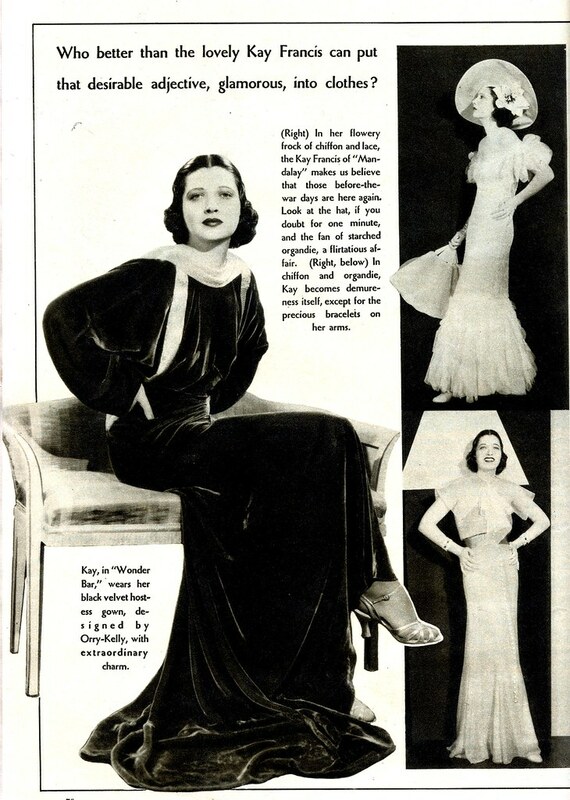 This ad is perfect proof of her glamours appeal -- "Who better than the lovely Kay Francis can put that desirable adjective, Glamourous, into clothes?" 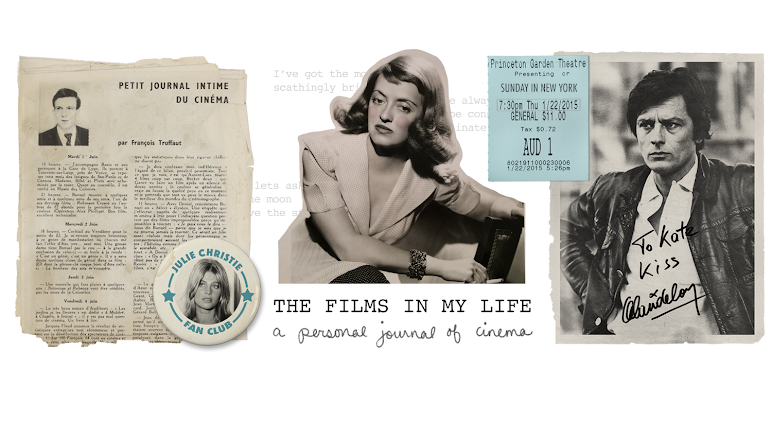 -- As Robert Osborne has said before almost all of her films, female audiences flocked to theaters not just to see the story but to see what gorgeous gown she would be wearing next! 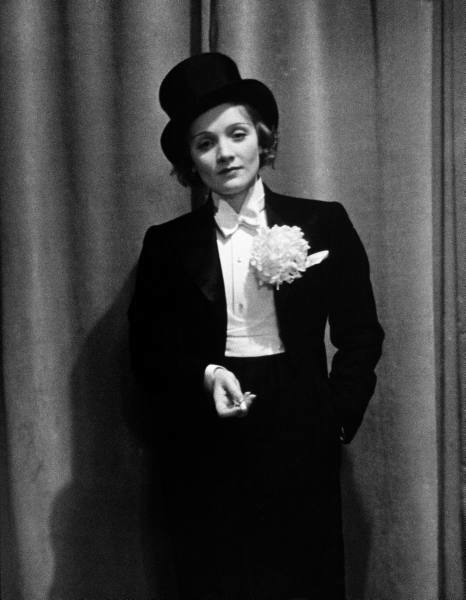 The Blonde Venus- TCM mentions Katharine Hepburn as the first gender-bending fashion icon, but I think it was really Marlene Dietrich. Even in The Blue Angel she was showing her taste for top hats. Which style icons would you include on your list? Especially about How To Steal A Million. That film is filled to overflowing with fashion defining moments...and that dress, with the mask, and the metallic eyeshadow...a definite WOW moment in film! 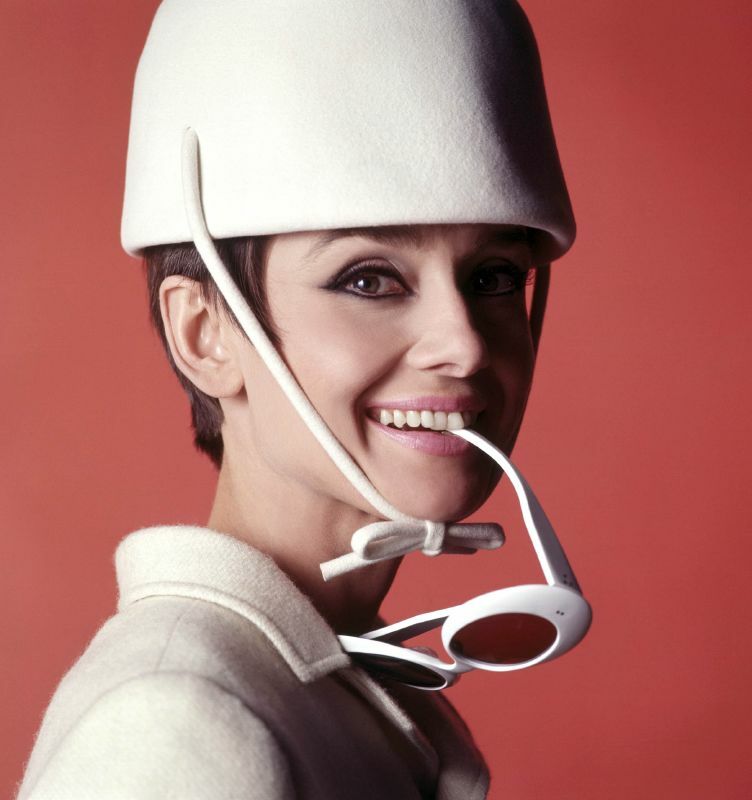 I remember when I first watched how to steal a million, I really wanted Audrey Hepburn's car and outfits! If only it was possible to pull looks like that off today! 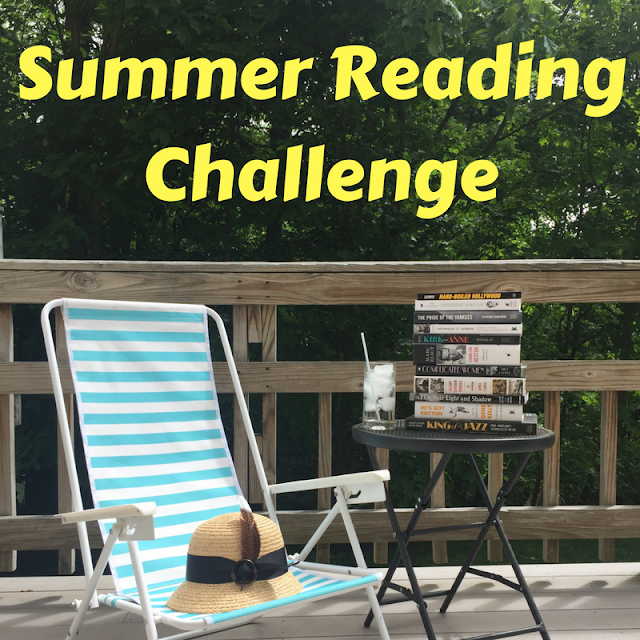 I would include Double Indemnity. Wonderful sweaters, pencil skirts, and glasses! I would also include a mid to late 30s "fashion parade" picture. Ones that come to mind are "Fashoins of 1934", "Roberta", and "The Women". Speaking about fashion, I really don't understand why Marilyn Monroe isn't noticed more. She was one of the first women in Hollywood, who had curves and she was never a size 0. She was the epitome of real beauty(with curves I means) and it's a real shame, she isn't as well remembered for her fashion as Audrey is. Great post! I really can't argue with any of your choices. Being male, it's hard for me to really pick female style icons, although I have always been partial to Jean Shrimpton, Diana Rigg, and Sharon Tate's tastes in clothes during the Sixties. 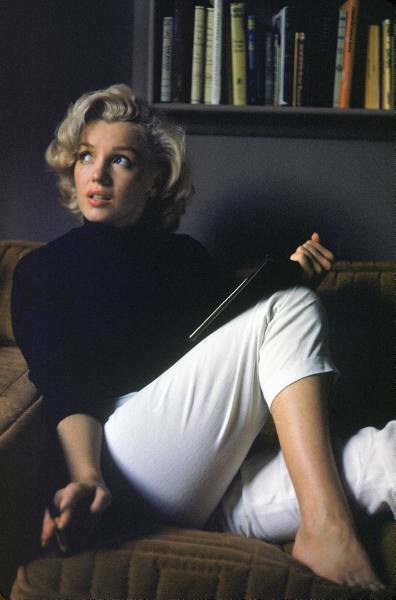 I am so in love with Marylin. Great choices. I just love How to Steal a Million and I think Doris Day is overlooked far too much, these days! Besides what you've mentioned, I'd probably include Jayne Mansfield, because her look was so extreme - I guess not many people really wanted to look like her but there's just something about her I love. I'd definitely include something with Molly Ringwald - probably Pretty in Pink because both her style and Jon Cryer's is magnificent. Um...gosh, there are so many! I thought just the same when I saw How To Steal a Million for the first time! My heart aches for those clothes. Isn't Carole Lombard with her slender figure and clothes a fashion icon of the 1930's? And Greta Garbo with her eye makeup! Oh, I wish I lived in Stockholm! Okay, no, but they have a Cinematek hosted be the Swedish Film Institute, and they show oh, so many classic movies all the time! 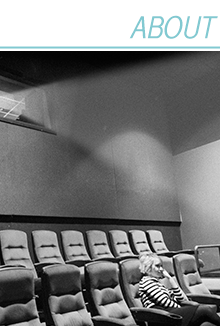 I had to write to you when I saw that they are showing a Dirk Bogarde film called "The Servant", 1963 - I took one look at the photo from the brochure and I think I need to see it! Have you seen it? Here's the photo I was talking about! I agree with all of these, but I am especially happy to see Kay Francis on the list. I loved her costumes in Trouble in Paradise. She could wear anything! What a great post, and I love the choices you listed, especially Kay Francis. Even in Cocoanuts, she looked so cool and fashionable in the midst of the Marx Bros' hijinks. Someone above mentioned THE WOMEN, which came to mind first when you asked for style icons. Stany's clothes in THE LADY EVE are wonderful, IMO. Teppi Hedren wears two outfits in THE BIRDS, and I'd like to own both. On a different note---When I was in college, URBAN COWBOY hit the theatres. The movie had a huge influence on fashion for a while. Cowboy boots and the western look were all the rage. Not my cuppa, but that's the way it was.